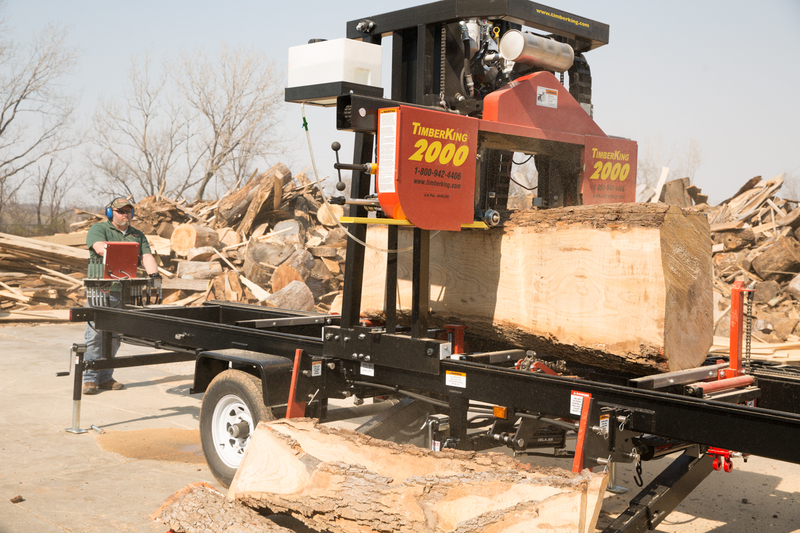 The 2000 mill is the choice for sawyers who need a fully-hydraulic, industrial duty machine that will handle big logs with ease. 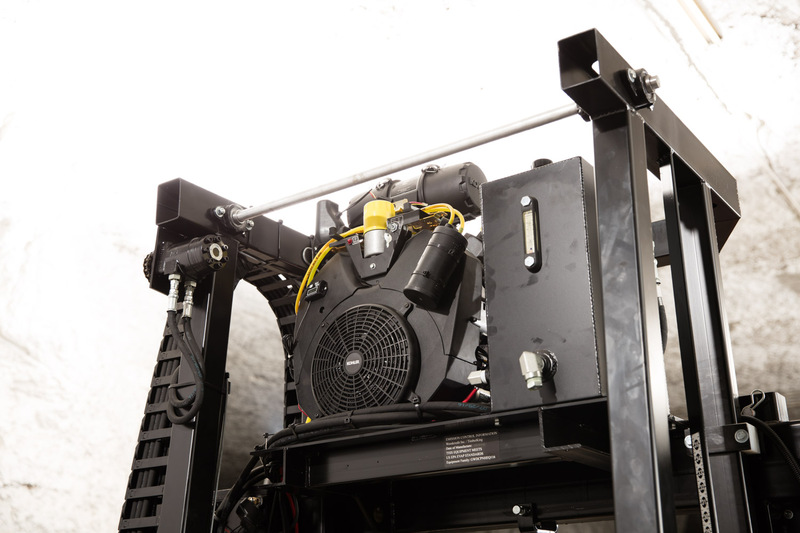 Solid-welded Big 3 Super-Structure comes packed with full Direct-Action Hydraulic Log Handling, our most advanced Computer Setworks, and loads of extras. Direct Action Hydraulic features: Hydraulic Blade Feed, Hydraulic Blade Up/Down, Hydraulic Log Loaders, Hydraulic Bi-Directional Chain Log Turner, Hydraulic Dual-Action Log Clamp, 4x Hydraulic Vertical Log Stops, Hydraulic Roller Toe-Boards. 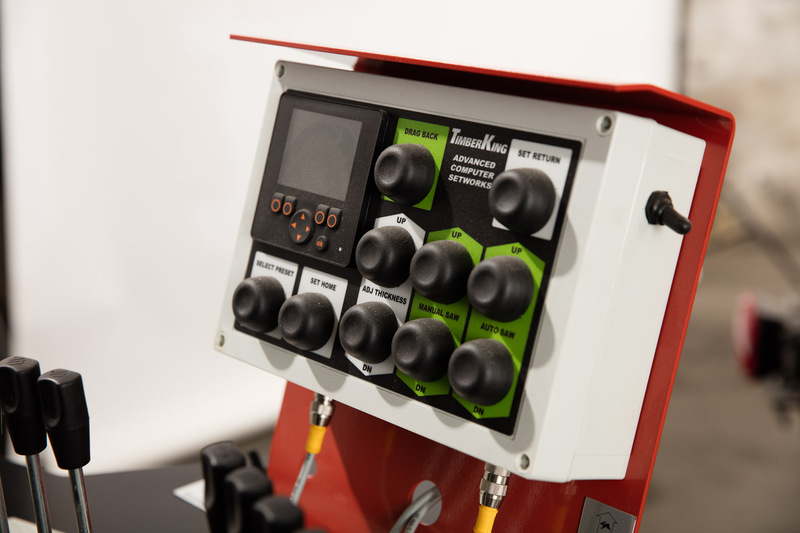 Fully-programmable advanced SuperSetworks gives accurate cuts, board after board, in the toughest conditions. Plus all the “extras” come standard: Massive Cut Throat, Electric Blade Clutch, Side-Wind Support Jacks, Greasable Blade Guides, Moveable Guide Roller, Operator-Height Swing Command Post. Call for a shipping quote. All mill prices are FOB Kansas City. Massive Big 3 Super-Structure. Solid-Welded Four-Post Head, Solid-Welded Twin Beam Log Deck and Solid-Welded Big-Beam Cut Core eliminate bolt-together structural designs common on competitive mills — and the constant readjustment and retightening that comes with them. Massive Solid-Welded Steel Cutting Deck with 8 2×6 Box Beam welded cross members for maximum strength. Made in USA. Big-3 Superstructure and all fabricated parts are Made in USA: cut, shaped, welded, painted and assembled right here in Kansas City. Kohler engine is Made in USA. Direct Action Hydraulics. 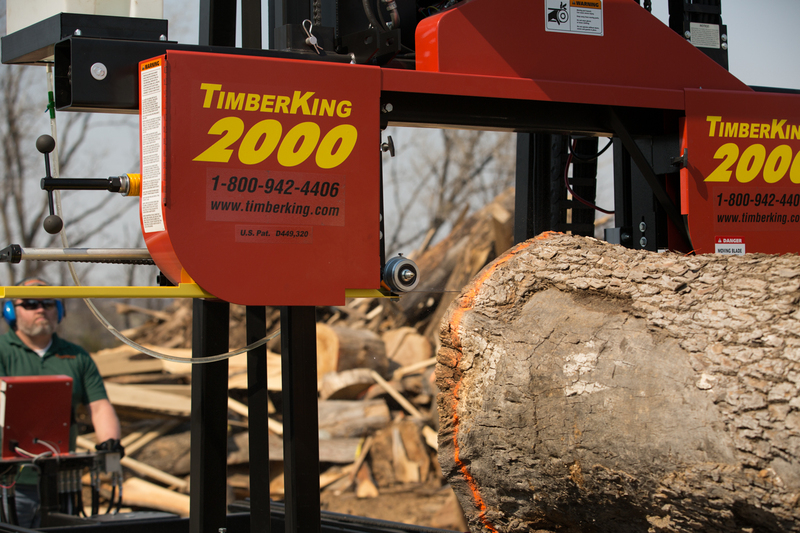 Every hydraulic TimberKing mill has simple, trouble-free, engine-driven, hydraulic controls. This is a proven, straightforward, DIRECT MECHANICAL solution… far more dependable than 12-volt electric switching and motors. We perfected this system over 15 years ago – and we’re flattered that others have decided to copy it. 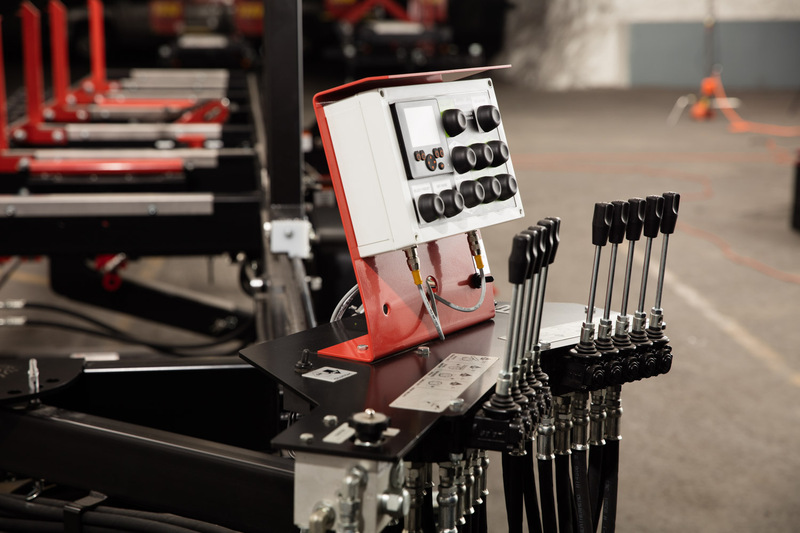 Operator-Height Hydraulic Swing Command Post – Hydraulic controls are at elbow-height, for comfortable and efficient operation over a long work day. Compare to other brands with crucial controls low to the ground, making operator lean over to operate basic mill functions. Full-Time Hydraulic Control. 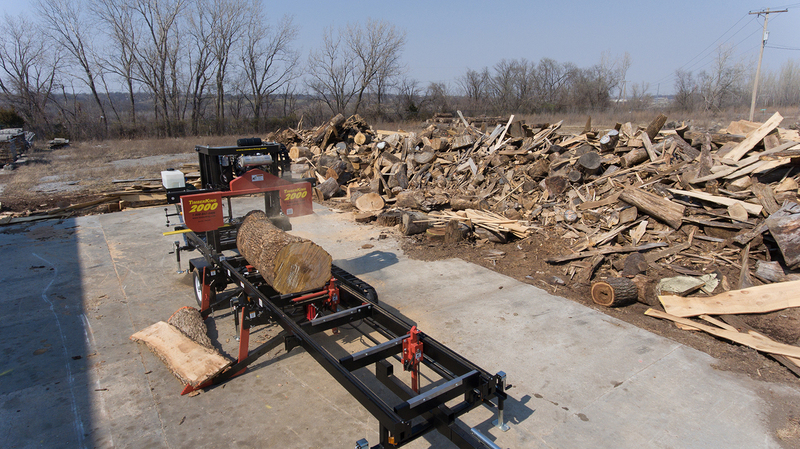 Crucial hydraulic log-handling tools — turners, log stops, log clamps, toe boards — work full-time. Compare to “part-time” hydraulics on competitive mills, where hydraulic tools disengage when the cutting head leaves the back of the machine. 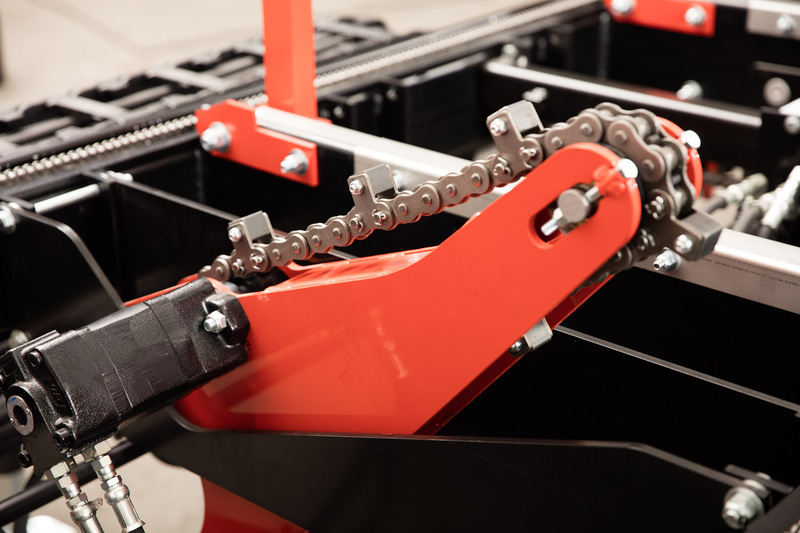 Bi-Directional Chain Log Turner with massive #100 chain and solid machined turner blocks lets you easily turn logs in both directions for perfect positioning. We invented it…now we’ve perfected it. Hydraulic Vertical Log Stops the same dependable design we’ve used for years, beefed up with solid two-by-two steel uprights. Hydraulic Log Loaders with twin, 5-ton rams, 1″ thick steel loading arms, self-attenuating supports, 5,000 lbs. capacity! 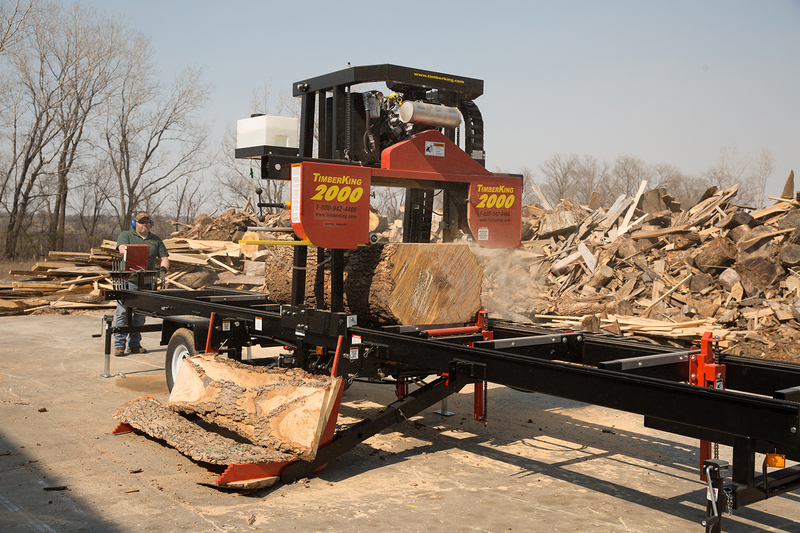 High-Speed Hydraulic Log Clamp allows you to remain at control panel. One lever moves powerful spike in and out. A second lever moves spike to the perfect height for every cut. 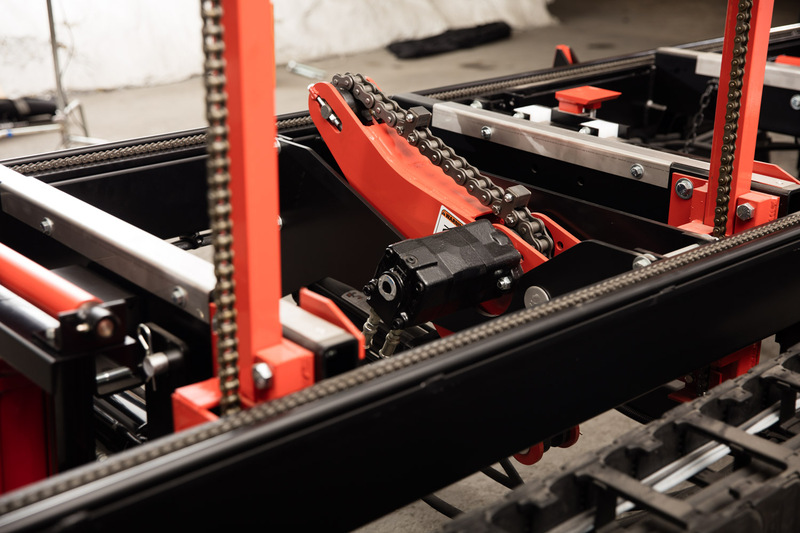 Hydraulic Chain Drive Cutting Head provides dependable, solid-state blade feed…eliminates slippage of cable-drive systems. Hydraulic Roller Toe Boards let you get the best boards from tapered logs. SuperSetworks computer-controlled cutting, board after board cut to specific thickness you select with the flip of a switch. Components meet the highest international standards. Setworks box and encoder meet IP67 standards ensuring total protection both from dust and complete immersion in water. In addition, encoder meets IP69 standards protecting it from jet sprayed water! Same rugged, powerful setworks used on 2500 mills. Hinged Blade Wheel Covers comes standard, blade engages with the flip of a switch. 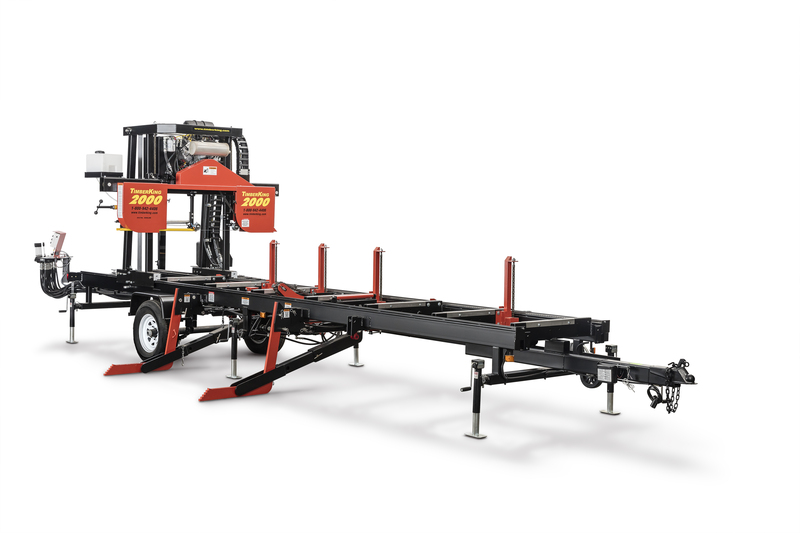 Massive Cutting Throat 35″ between the guide rollers, 16″ clearance above the blade, 29″ max clearance above the log deck gives you the capacity to easily handles logs up to 36″ in diameter…and beyond. Electric Blade Clutch comes standard, blade engages with the flip of a switch. An expensive upgrade on competitors’ mills. Greasable 3″ Blade Guide Rollers greaseable bearings and large diameter dramatically increase blade and bearing life. Available Debarker cuts a clean path for blade – increases blade life and cut accuracy. Available Board Drag Back brings board back to operator’s end for higher daily production. Heavy Duty Industrial Energy Chain binds hydraulics in a coat of protective armor…safe from abrasion and damage. Lines are tucked along side of machine, can’t get caught on over-hanging limbs, branches or gateways. Auto Blade Guide adjusts with flip of a switch to varying work-piece widths. 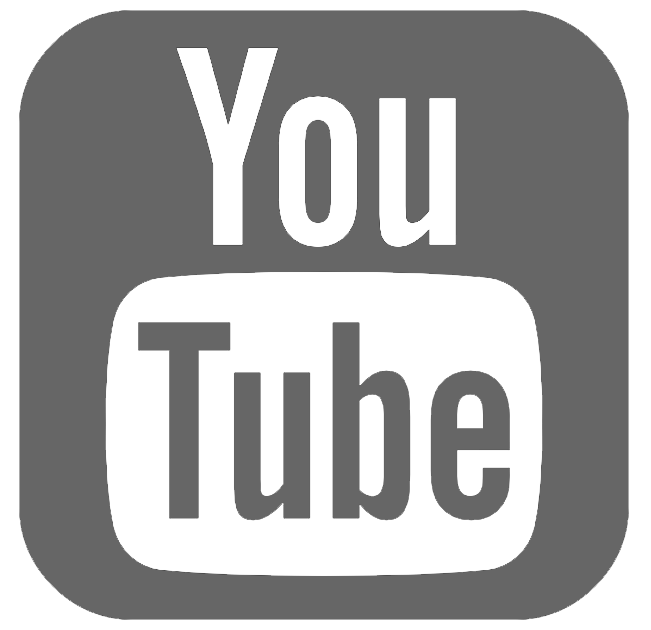 Specifications refer to standard configuration mills and are subject to change without notice. 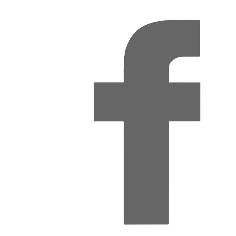 30-Day, No-Risk Money-Back Guarantee. You take no risk! When your 2000 mill arrives, put it to work for 30 days completely at our risk. Use it as much as you like. Make absolutely certain that it is everything you expected. If you are not entirely pleased and satisfied, simply notify us and return it within 30 days (shipping pre-paid by buyer) for a full refund of the mill’s purchase price. 3-Year Limited Mechanical Warranty. 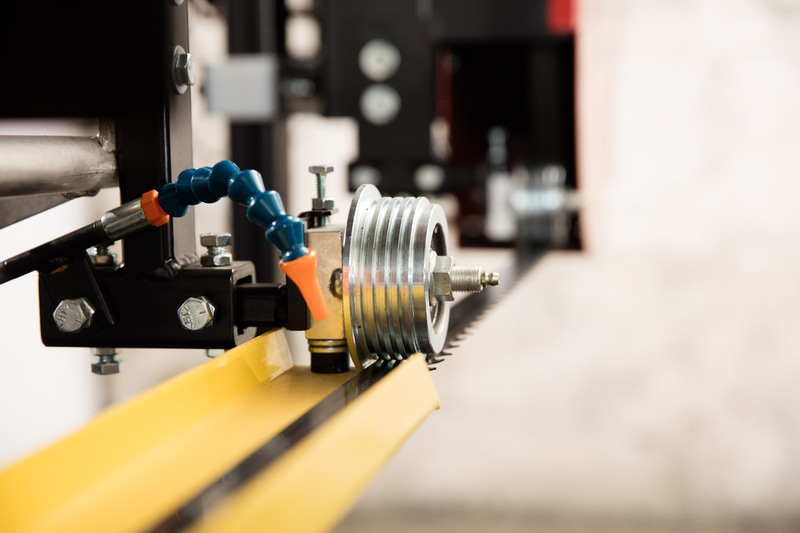 Your TimberKing 2000 and all attachments have been built with the best materials and components and carefully inspected at our factory. We will, at any time within three years from the date of delivery, repair or replace (our option) any part which is defective in materials or workmanship. This includes parts not directly manufactured by TimberKing, Inc. such as bearings, electrical systems, and hydraulic components. Obvious wear parts such as blades, belts, and tires, of course, are not included. Call or write for details. 5-Year Limited Log Deck Warranty. 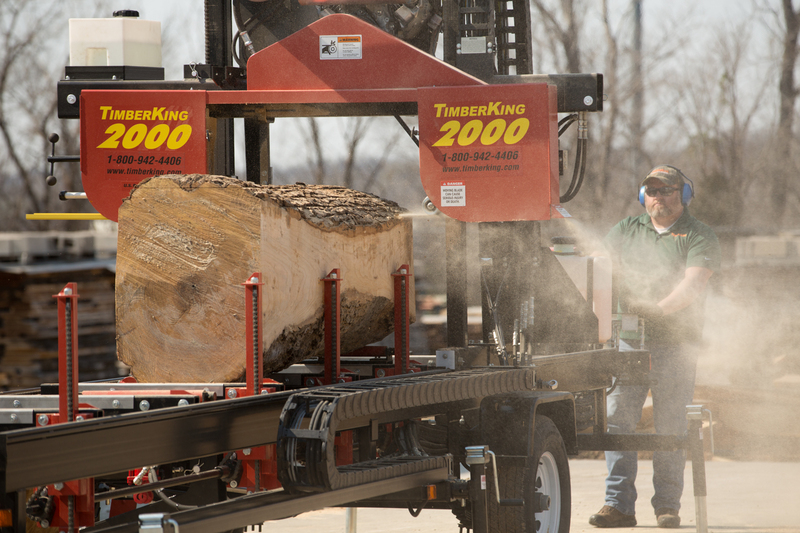 In addition to TimberKing’s Industry-Best 3-year warranty, the log deck weldment on 2000 mills is covered for a full 5 years against defective materials or workmanship. Call for details.